The result of constrained inventory and an abundance of buyers are bidding wars. Many homes are selling significantly above the asking price. 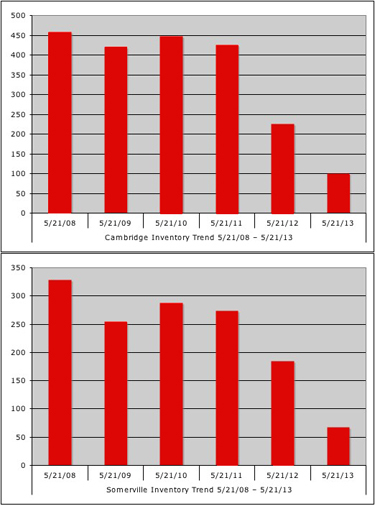 The inventory of residential real estate in Cambridge and Somerville is extraordinarily low. On May 21, 2013 there were only 100 units of residential real estate (single families, condos, and multifamilies) in Cambridge and 68 units in Somerville. For comparison, during the buyer's market in 2008 there were 458 units available in Cambridge and 329 units in Somerville. A multifamily on Erie Street, Cambridge had over 30 offers and sold for $261,000 over the asking price. A multifamily on Pine Street, Cambridge had 17 offers and sold for $103,100 over the asking price. A condo on Tremont St, Cambridge had 9 offers, over asking, cash. A condo on Morrison Ave, Somerville had 9 offers. A single family on Dudley Street, Cambridge had 8 offers. A multifamily on Teele Avenue, Somerville had over 25 offers. A condo on Sixth Street, Cambridge had 11 overs. Sold for $76,000 over asking price. The buyers that lost in these bidding wars are still looking. If you have a home to sell in Cambridge, Somerville and surrounding towns there are many buyers ready to make an offer. Compared to the past several years, now is the best time for a homeowner to put their home on the market. If you are interested in the new value of your home please contact us for a free value analysis.